Imam bayildi—literally translated to ‘imam fainted’—is a prominent dish from the Ottoman cuisine. 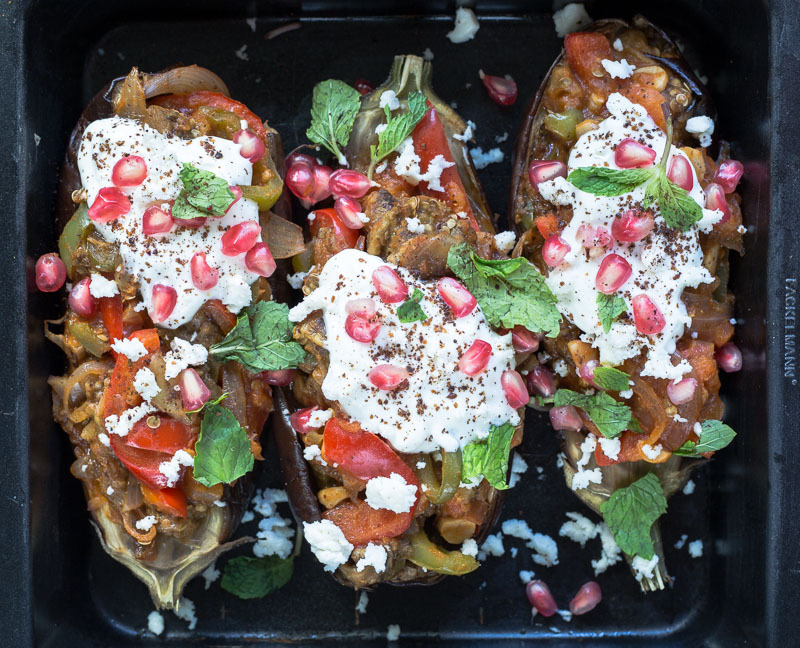 Halved aubergines are roasted and their soft flesh scooped out and mixed with onions, garlic, tomatoes and a heady mix of spices before being stuffed back into their skins and baked. With plenty of olive oil. 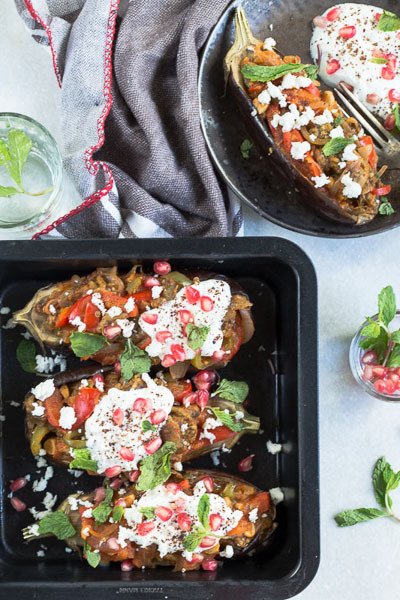 The recipe for these aubergine boats may be fairly straightforward, but the story behind its name is a fascinating one. 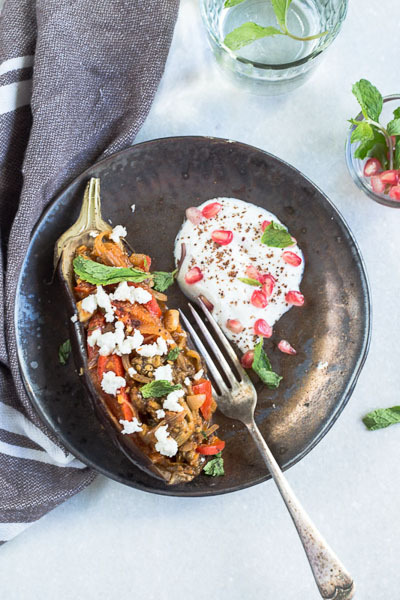 There are plenty of different versions as to why the guy in fact fainted: legend has it that a Turkish imam was presented with a stuffed aubergine dish and that he swooned with the sheer pleasure of having eaten something with so much flavour. A more prosaic version of the story goes that a Turkish imam married the daughter of an olive oil trader who brought with her twelve cases of olive oil as dowry. Stuffed aubergine being her husband’s favourite dish, she made it for him every day for twelve days. On the thirteenth day however, when it didn’t turn up to the table and the imam learned that it was because all the oil had been used up, he fainted. Before I go any further, let me just point out that no fainting will be happening here for the amount of oil used (four tablespoons total), although I can’t make any promises for the swooning at the flavour part (!) I ate this dish when I was travelling in Turkey a few years ago and it was one that I definitely wanted to recreate back home. It took me a few years to get down to it and going by how simple it was to make, I have no idea why I waited this long. If you have a bit of a meat tooth (apparently, a term), some minced lamb or beef in the stuffing would work really well here. The imam bayildi that I ate there (the more authentic version I presume) had the aubergine boats swimming in a pool of olive oil and occasionally even came with a tomato sauce. I skipped this and added tomatoes to the stuffing instead. It is just an easier step without compromising on flavour. Turkish chilli peppers were a prominent ingredient in the stuffing used there but since they are not available where I live, banana peppers made for a good substitute. A dollop of yogurt, pomegranate arils, mint leaves and a crumble of feta add freshness to the dish. Serve with crusty bread to mop it all up. Swooooon. Preheat oven to 180 C (360 F) and line a baking tray with aluminium foil. 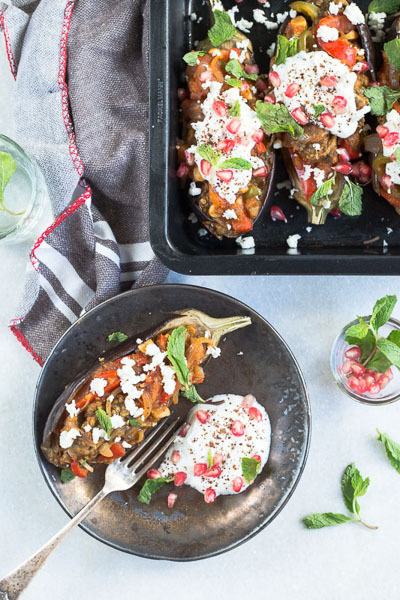 Slit each aubergine into half lengthwise and score the flesh deep enough but not all the way to the skin in a cross-hatch pattern. Drizzle over olive oil and salt and cover with foil. Roast for 20-25 minutes until tender but still holding their shape. Once cooked, scoop out the flesh and seeds and set aside in a bowl, making sure to keep the skins intact. Retain the skins. Meanwhile, make the stuffing: Add olive oil to a pan and sauté onions and peppers until soft. Add garlic, cumin powder, coriander powder, paprika, oregano, sumac, tomato purée and the roasted aubergine and cook for 2-3 minutes on a low flame. 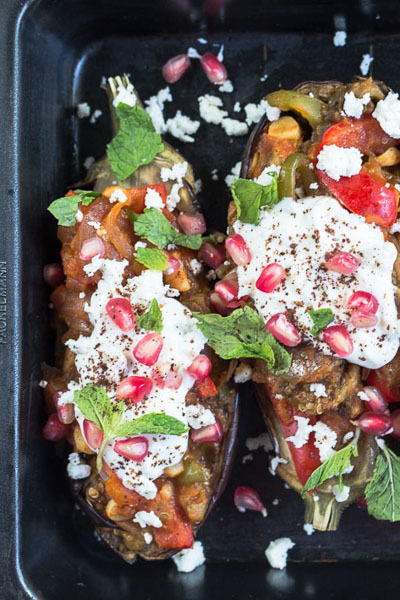 Add a generous amount of stuffing into each eggplant half and place in a baking dish. Cover with foil and bake for 15-20 minutes. To serve, top each half with a dollop of yogurt, mint leaves, a few pomegranate arils and crumble over some feta cheese. Can be eaten as is or with crusty bread on the side.